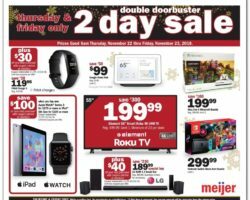 Browse Meijer Weekly Ad & Deals. Find this week Meijer Ad sale, digital coupons, current flyer prices, apparel sales, and the latest grocery specials. Shopping at Meijer means there is a very good chance of finding everything for every need as the store carries foods, small appliances, tools, jewelry, home improvement, shoes and clothing among other types of merchandise. As a department store, Meijer gets points for a great selection of items and decent overall prices on what they carry. More than offering a great variety of groceries, Meijer stocks all the major brands and more affordable choices to cater for all budgets. For extra savings, they provide competitive deals in all categories and discount in select departments up to 40% on a regular basis. The store has clearance deals for toys with extra money off already reduced items, 10 for $10 deals, and mix and match with free item, buy one get one free promotions, and Mperks rewards. Meijer loyalty program allows customers to earn rewards automatically at the register with simply entering their mPerks ID and PIN number plus more savings are to be had across the store with special just-for-members discounts.